Actress Mehrnoush Esmaeilpour, who is principally an architect and artist, is the guest of RenArt Gallery & Art Consultancy with her new solo exhibition, "From Here to Now," after a three-year break. Esmaeilpour reflected the naiveté and nobility of figures of horses and women. 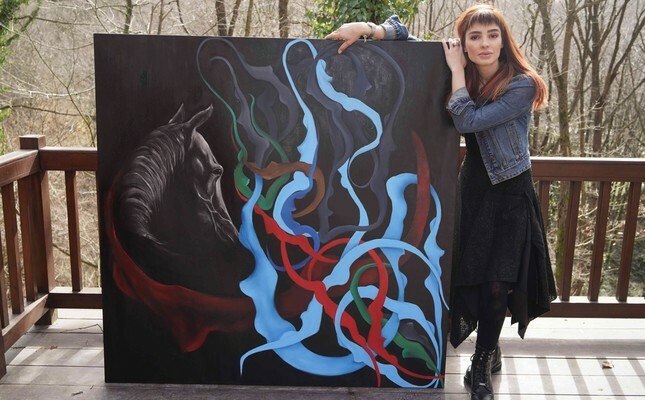 The artist has many Turkish fans from her roles in "Bir Zamanlar Osmanlı Kıyam" (Once Upon a Time Ottoman Rising), "Hayat Çizgisi Suriye" (Lifeline Syria), "Babamın Günahları" (My Father's Sins) and especially the TV series "Son" (The End), which has aired in many countries. She reflects her biggest passions in her paintings, which have been exhibited at RenArt Gallery & Art Consultancy since April 12. Esmaeilpour, who received training in horse genetics and horse coaching, processes the free, naive and royal spirit of horses in her art. She uses women with horses as she thinks they have the same spirit. "The freedom of women and horses about love and enthusiasm is restricted as fate. I know the genetics and spirit of horses as I had some training and have ridden horses for years. I am so close to them and can connect with them." She mentioned that she smells horses at her workshop as well as the paints at her workshop, returning to her childhood memories, reflecting her past on the canvases. The exhibition is op3en until June 2 at RenArt Gallery & Art Consultancy.